0453 - Mobile Command - Heroes Inc.Heroes Inc. Figured I’d post Monday’s comic a bit early since I gave you filler for Thanksgiving. Also, you can check it out here in HD. This entry was posted in Story and tagged Chrono, Lucca, Magus. Bookmark the permalink. I hope he’s talking about Mobius One! cool looking comic though I wonder what aircraft the Mushroom kingdom uses. Since you updated today are you going to get zapped tonight? Or does this count as Mondays update? What, has he completely forgotten about the epoch? The Epoch can only carry three people. 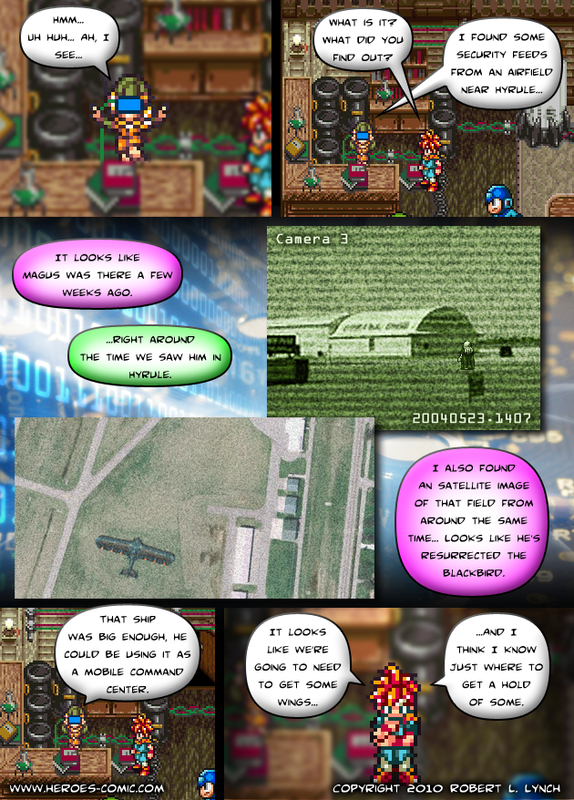 Crono has a party of four. I’d say it’s Link who has a party of four. As for Epoch, wouldn’t it be possible for Lucca to install an extra seat? can’t chrono go to the end of time and leave one of them there? then the rest could learn magic from spekkio!